To measure conversion, you can choose to install the official WooCommerce Google Analytics plugin. However, this is not advisable because there are many users who have installed this plugin have reported issues with inaccurate data reporting. In fact, we have found out that the plugin has a poor review rating of 2.9 out of 5 star rating. The answer is that you can choose 2 different plugins to track your online store conversions. 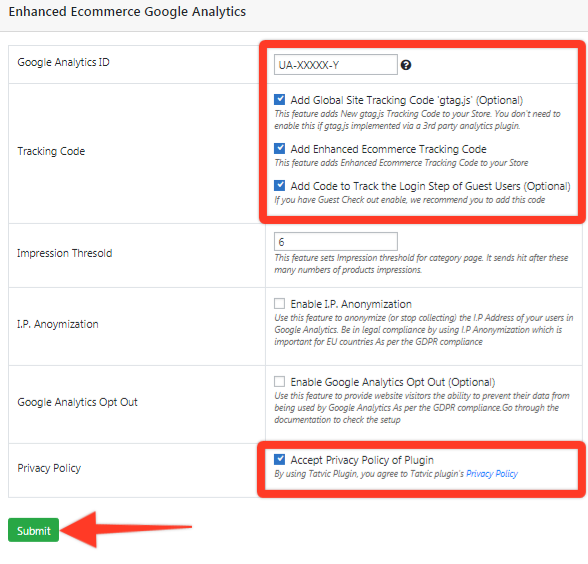 You can utilize Google Analytics eCommerce feature, which is what we are going to show in this tutorial (also a bit advanced). The other plugin will simply use the manual conversion code. Click on the Admin icon (appears as gearbox as highlighted below) and click on Create Account for the sole purpose of obtaining a new Google Analytics code for your WooCommerce store. Remember to fill up all the necessary details such as Account Name, Website Name, Website URL, timezone, Data Sharing settings etc. before clicking on** Get Tracking ID** button. Next, you shall click on Ecommerce Settings as highlighted below. Make sure to turn on Enable Ecommerce & Enabled Enhanced Ecommerce Reporting and fill up Checkout Labeling labels such as Step 1 : Checkout View; Step 2 : Login; Step 3 : Proceed to payment as shown below before clicking on the Submit button. That&apos;s all for setting up Enhanced Ecommerce inside Google Analytics. Let&apos;s move on to installing the Enhanced Ecommerce Google Analytics plugin. Login to your WordPress Admin dashboard and click on Add Plugin under the Plugin section. Enter "Enhanced Ecommerce" in the search bar. Next, click on Install and followed by the Activate button. Click on Tatvic EE Plugin on the left sidebar of WordPress. You need to enter your Google Analytics ID and check the boxes for the following as highlighted below. Press the Submit button to finalize changes. If you have a guest checkout on your WooCommerce store, then Check the box “Add Code to Track the Login Step of Guest Users”. If you have a guest login but you do not check the box, then it might cause an uneven funnel reporting in Google Analytics. Congratulations! That&apos;s all you need to know about setting up Enhanced Ecommerce Google Analytics Plugin.